The right to freedom of religion or belief, as enshrined in international human rights documents, is unique in its formulation in that it provides protection for the enjoyment of the rights "in community with others". This book explores the notion of the collective dimension of freedom of religion or belief with a view to advance the protection of this right. 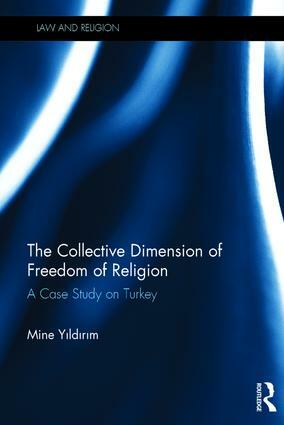 The book considers Turkey which provides a useful test case where both the domestic legislation can be assessed against international standards, while at the same time lessons can be drawn for the improvement of the standard of international review of the protection of the collective dimension of freedom of religion or belief. The book asks two main questions: what is the scope and nature of protection afforded to the collective dimension of freedom of religion or belief in international law, and, secondly, how does the protection of the collective dimension of freedom of religion or belief in Turkey compare and contrast to international standards? In doing so it seeks to identify how the standard of international review of the collective dimension of freedom of religion can be improved. Mine Yildirim is Head of the Norwegian Helsinki Committee Freedom of Belief Initiative in Turkey, Norway. The practice of religion by individuals and groups, the rise of religious diversity, and the fear of religious extremism, raise profound questions for the interaction between law and religion in society. The regulatory systems involved, the religion laws of secular government (national and international) and the religious laws of faith communities, are valuable tools for our understanding of the dynamics of mutual accommodation and the analysis and resolution of issues in such areas as: religious freedom; discrimination; the autonomy of religious organisations; doctrine, worship and religious symbols; the property and finances of religion; religion, education and public institutions; and religion, marriage and children. In this series, scholars at the forefront of law and religion contribute to the debates in this area. The books in the series are analytical with a key target audience of scholars and practitioners, including lawyers, religious leaders, and others with an interest in this rapidly developing discipline. Professor Norman Doe is Director of the Centre for Law and Religion, which he set up at Cardiff Law School in 1998. Carmen Asiaín is a Law Professor at University of Montevideo (Uruguay). Paul Babie is Professor and Associate Dean (International), Adelaide Law School. Pieter Coertzen is the chairperson of the Unit for the Study of Law and Religion in the Beyers Naudé Center for Public Theology, Faculty of Theology, University of Stellenbosch. Alison Mawhinney is a Reader in Law at Bangor University. Michael John Perry is a Senior Fellow at Emory University’s Center for the Study of Law and Religion and has held a Robert W. Woodruff University Chair there since 2003.